← Gregory has become a trusted authority on hip replacement among family and friends! Be sure to wear sunscreen and use Chapstick! Start with a thin layer made of wicking fabric. Stay away from cotton – it holds the moisture. An outer, breathable layer will can help protect you against wind and precipitation. If it’s really cold, you’ll need a middle layer, such as polar fleece, for added insulation. As much as 30% of your body heat escapes through your hands and feet. On mild days, wear running gloves that wick moisture away. Mittens are a better choice on colder days because your fingers will share their body heat. If the wind is strong, it penetrates your clothes and removes the insulating layer of warm air around you. 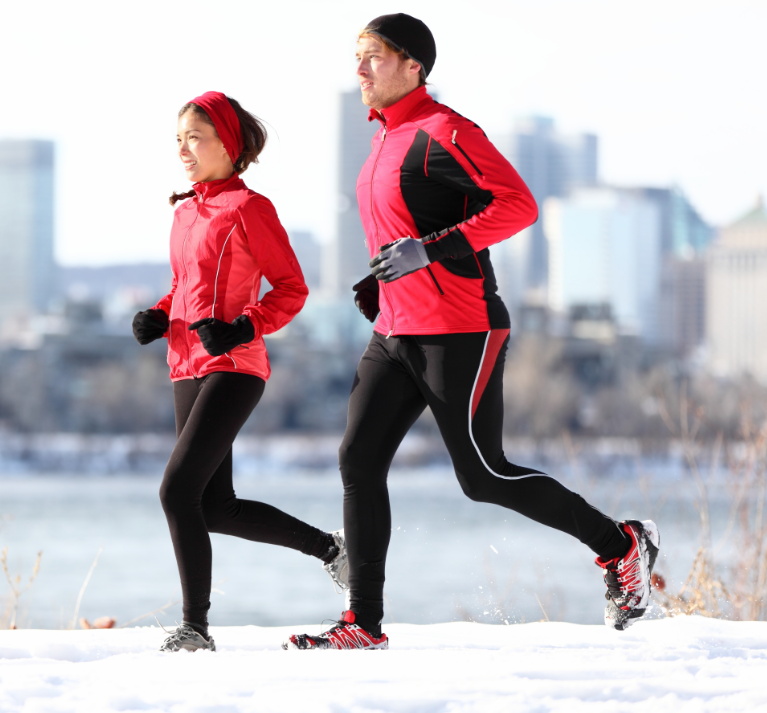 If the temperature dips below zero or the wind chill is below minus 20, it may be better to hit the treadmill instead. You’re going to warm up once you get moving, so you should feel a little bit chilly when you start your run. A good rule of thumb: Dress as if it is 20 degrees warmer outside than it really is. Wearing a hat will help prevent heat loss, so your circulatory system will have more heat to distribute to the rest of the body. Make sure you monitor your fingers, toes, ears and nose. They may feel numb at first, but they should warm up a few minutes into your run. If you’re wet, change your clothes and get warm as quickly as possible. Despite the cold weather, you’ll still heat up and lose fluids through sweat. Cold air also has a drying effect, which can increase the risk of dehydration. So keep drinking water. Follow Your Instincts – If you feel unsafe, trust your gut and run to a safe location. Ditch Your Music – Cutting off your sense of hearing leaves you at a disadvantage.